Since first bursting onto the scene in the 1980’s with his band Hothouse Flowers, Liam has captured the attention of audiences, critics and musicians alike. According to “Rolling Stone Magazine” Bono noted the ensemble were the “best unsigned band on the planet.” It is no wonder that Liam remains a “musician’s musician” and no surprise he has performed alongside the best of them. 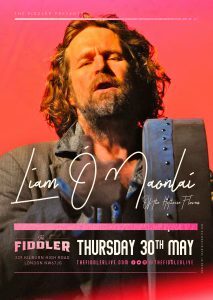 As a solo performer as well as frontman of Hothouse Flowers, Liam continues to wow audiences worldwide reinventing himself with each performance.